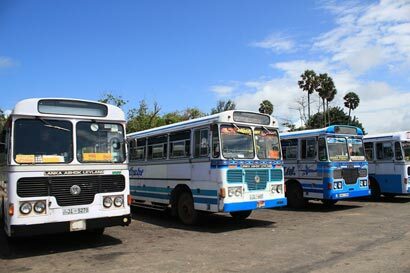 Private buses operating in several areas between Vavuniya and Jaffna have gone on strike this morning (September 9) demanding that two members of the Vavuniya Bus Association be released from police custody. Buses operating from Vavuniya to Jaffna, Mullaitivu, Kilinochchi and Mannar have halted operations this morning. The incident that led to the arrest of the two bus association members involved a bus traveling from Hambantota to Jaffna which allegedly illegally picked up passengers in Vavuniya. Following a heated incident between the two parties, police arrested two members of the Vavuniya Bus Association. The bus strike will continue until the two arrested suspects are released or those operating the Hambantota-Jaffna bus in question are taken into custody, the protesters stated.